"From Your Lips To Our Fingers"
Excel Reporting, Inc. of New York is a Long Island-based court reporting agency providing full litigation support for the legal community on Long Island, New York, Brooklyn, Queens, Bronx, Westchester, Upstate New York (Buffalo and Rochester), including Nassau and Suffolk counties since 1990, as well as nationwide. Excel provides nationwide court reporting as well as international videoconferencing for depositions, hearings and meetings. To compliment our array of services, we provide a website transcript repository, which allows 24/7 access to transcripts, a great convenience to our clients. Excel Reporting, Inc. is a New York State-Certified Woman Owned Business Enterprise (WBE) certified with New York State, New York City and Nassau County. We are committed to providing quality, professional court reporting. We care about you and your clients. Our clients are not treated like numbers. Get the personalized service you deserve and will receive without sacrificing professionalism, quality and the most up-to-date technology available in the legal industry. We value our clients and, as a result, our clients value us. Court Reporting and transcription in matters from personal injury to matrimonials, construction cases, product liability, legal malpractice and medical malpractice, employment law, harassment, discrimination, labor law and civil rights law, Excel has a court reporter to fulfill all of your litigation needs. We cover depositions and Examinations Before Trial, hearings, Workers Compensation, Civilian Complaint Review Board interviews of police officers and civilians, Examinations Under Oath for all of Long Island, from Riverhead to Mineola to Queens. We cover the Greater New York Metropolitan area, including Brooklyn, Bronx, Queens, Staten Island and Westchester. Scheduling of videography for depositions as well as video-conferencing and video-syncing can also be done when you order your Excel court reporter. Enjoy the convenience of our Mobile Transcripts by simply clicking on the Transcript Repository and entering your user name and password. We store and archive all of your transcripts, giving you access to them 24/7. Transcripts can also be dowloaded or emailed to you in any format, i.e., PDF, ASCII, CD, RTF. The search feature within the website repository is a helpful way for attorneys, legal assistants or claims adjusters to digest the transcripts using the Word Index which is displayed while viewing your transcripts. In addition, you will be auto-notified as soon as a transcript goes onto the repository, so you'll know when it's available even before you receive the paper transcript. Excel Reporting, Inc. is proud to announce our state-of-the-art conference room centers, a multitude of which are located in the New York City Metro area, including all five boroughs, as well as White Plains and Long Island; many of them are conveniently located in close proximity to the courthouses. Our conference room centers offer WiFi, copying, faxing and light refreshments. Our Long Island offices include both Nassau and Suffolk counties. In addition, we offer high-end conference rooms throughout the United States when you order your Excel court reporter. All conference room centers are provided to our clients free of charge, with our compliments. For those participants who may not wish to travel, we also provide videoconferencing and multi-location phone conferencing depositions. Videosync is also available and we can schedule your videographers and language interpreters as well. Excel Reporting,Inc. is vetted and approved by a multitude of insurance carriers. We provide court reporting services to both plaintiff and defendant firms, so we understand all realms of court reporting in the legal world. A few of the insurance companies we provide court reporting services to are Allstate Insurance Company, The Travelers, MetLife, Encompass, Lancer, Medical Liability Mutual, Old Republic Insurance Company, State Farm and Mercury Insurance. 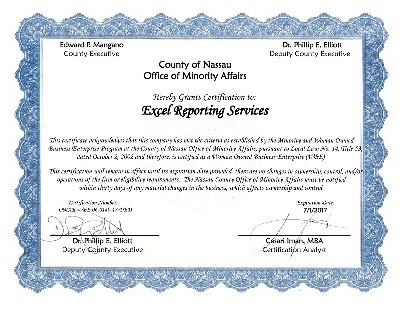 Excel Reporting, Inc. is a New York City Certified Woman-Owned Business Enterprise (WBE). Additionally, we hold WBE certification with New York State and Nassau County. 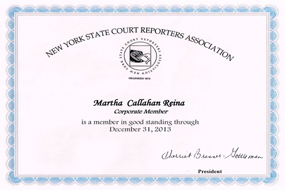 We are members in good standing with the National Court Reporters Association, Guardians of the Record, as well as New York State Court Reporters Association. 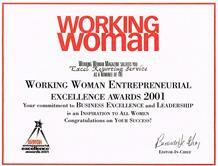 Excel was nominated for the Working Woman Entrepreneurial Excellence Awards 2001. In addition to High-Definition PolyCom Video-Conferencing, Excel also provides Portable Video-Conferencing, a more affordable means to participate in a deposition without the cost of travel. Excel has a secure, low-cost way to depose witnesses in other locations without the time and cost associated with travel. Now you can remain sitting in your own office or home, and participate in a deposition taking place hundreds of miles away. Communicate fully with the deponent and all participants face-to-face! We have partnered with Zoom™, the leader in technology solutions for the legal community, providing secure video conferencing for our clients, wherever their case may be. Excel's portable video conferencing relies on secure AES-128 bit encryption and HMAC-5 encoding message authentication, including integrated voice and video for improved synchronization. Enjoy easy-to-access multi-point video conferencing anywhere with a webcam-connected PC, iPhone, iPad or Mac. CART (Communicative Access RealTime) services are available upon request for the hearing impaired. Whether you're a high school or college student or a witness being deposed in a legal proceeding who would prefer to have the additional backup of RealTime, contact us and we will facilitate a CART setup for you. We also provide remote CART through Streamtext, if so desired. Remote CART allows the deaf or hearing impaired individual to participate in a meeting or event without the CART writer being physically present. All that is needed is a landline with a speakerphone and a laptop with internet connection. We provide CART for numerous government agencies, both remotely and on-site. Our CART writers have transcribed for college students from C.W. Post College, Touro College, Columbia, NYU and Cornell, to name a few. One writer is assigned to each student and "CARTs" for that student throughout the entire semester of that student's full course load. This enables the student and CART writer to develop a more effective partnership and rapport that enables the student to get the very most out of his/her college experience. 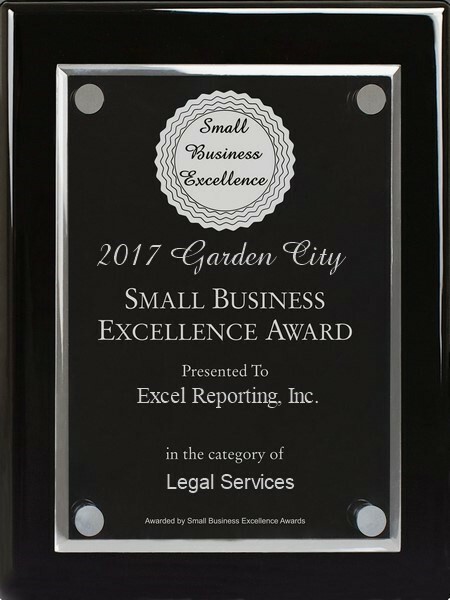 Garden City, - August 14, 2017 — Excel Reporting, Inc. has been selected for the 2017 Garden City Small Business Excellence Award in the Legal Services classification by the Garden City Small Business Excellence Award Program. Various sources of information were gathered and analyzed to choose the winners in each category. The 2017 Garden City Small Business Excellence Award Program focuses on quality, not quantity. Winners are determined based on the information gathered both internally by the Garden City Small Business Excellence Award Program and data provided by third parties. The Garden City Small Business Excellence Awards recognizes outstanding small businesses that serve the Garden City area. Each year, our selection committee identifies businesses that we believe have achieved outstanding marketing success in their local community and business classification. Recognition is given to those companies that have shown the ability to use their best practices and implemented programs to generate competitive advantages and long-term value. These are small businesses that enhance the positive image of small business through service to their customers and our community. These exceptional companies help make the Garden City area a vibrant and vital place to live. The Garden City Small Business Excellence Awards was established to reward the best of small businesses in Garden City. Our organization works exclusively with local business owners, trade groups, professional associations and other business advertising and marketing groups. Our mission is to award the small business community’s contributions to the U.S. economy.